Have you noticed how we tend to resist the idea of change? Just adding the word ‘change’ has the potential to put people’s backs up or make us feel wary. If our boss says, ‘We’re going to change the office’ or ‘We’re going to change some processes’, we often have an immediate reaction to the idea. Yet if the word itself is changed it changes our response. ‘We’re going to improve the office’ and ‘We’re going to improve some processes’ sound more encouraging by comparison, somehow easier to hear and take on board. Because we easily become accustomed to what we have, how we do things and how things are, it is easy to resist change; it feels comfortable staying with what we know. Yet many of us want our lives to be better in some way, be that at home or at work, health-wise or socially. I specialise in altering mindset and helping people make changes for the better, yet I’m as guilty as the majority when it comes to resisting change. Let me give you an example of how circumstances influenced me to make small changes, and how the result could help you make your own positive changes – for free. In 1964 Bob Dylan wrote “The times they are a-changing”; he was right then and 52 years on he’s still right. Like it or not, change is constant. When I was writing my book, Pieces of the Possible, I was adamant I wouldn’t self-publish; after all, at the time, self-publication was referred to as ‘vanity publishing’. But by the time I was ready to go to print the market had changed; publishers often expected an author to be self-published before they took real interest. Then I was absolutely clear in my mind that I wouldn’t succumb to reading e-books, since I prefer the look and feel of a good old-fashioned paper book. But then I went on a special holiday and had limited weight capacity on the flight and would have been massively restricted on what books to take… so I ended up buying a Kindle and haven’t looked back since (although I still buy all my reference material in hard copy). So, when it came to reworking the website for my training consultancy, More Than Words, I realised it was time to add Pieces of the Possible as a free audiobook download. One of the factors that influenced my decision was recent research by the Association of American Publishers, which revealed that audiobook downloads increased by 38.1% in 2015. Another was a comment on CNBC by Tracey Markham (country manager at Audible), saying that audiobook growth is consistent as consumers realise how well audiobooks can fit into their busy lives. I went on holiday again recently and found myself listening to books as much as reading them. One was the audio version of Pieces of the Possible. As I’d been too busy devising and carrying out my training courses, I hadn’t had time to record it myself, but knew I could trust my friend Richard Burnip, who records audiobooks for a living, to do a good job. As you can imagine, it was a slightly nervous moment for me to listen to my book being read by someone else. After all, I’d spent years telling the story that is Pieces of the Possible in my head as I wrote it. In my mind I’d clearly formed what the characters looked like and, more importantly, what their voices and intonations sounded like. It’s fair to say that the books we love often become highly personalised to us because we create the pictures and sounds in our head as we read. Yet, despite these reservations, I found myself listening to my book with fascination. It worked. I was drawn into the story and actually enjoyed listening to the characterised voices. In fact, I distinctly remember catching myself smiling as I listened, not just from enjoying the story, but because I was proud of the version I was hearing. 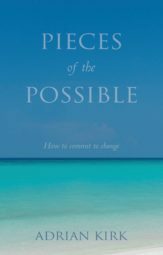 Pieces of the Possible is a book written to help people make personal change; it is entirely focused on the individual becoming aware of how they have contributed to their life being as it is, and it shows how to create mind-shifts which enable personal change to happen. I’d taken my recent holiday because I needed some time out, and had headed to a yoga retreat to properly relax and recharge. What is fascinating for me is that I listened to my book with fresh ears and was able to let the ideas which form the backbone of the story filter in to me, even as the writer. Feel free to download my audio book and maybe even share the link with friends, colleagues and family.